In a fire season such as this, trying to report on each fire individually gives an inaccurate account of the entire situation. Inevitably, though, as fire resources are stretched thin, so is the ability to report on all incidents simultaneously and with the breadth and depth they warrant. Those who try still end up seeing only a piece of the larger story. As anyone with skin and the most remote connection to media (TV, online, print, radio, whatever) knows, it’s exceptionally hot, exceptionally dry, and exceptionally dangerous in the Northwest this year. A note on those numbers: 1. They’re out of date the second they’re typed since so much growth has happened over the past three days – and will continue today. 2. The number of fires doesn’t reflect all the fires burning at any given time, just those large enough to be named and traced by the federal fire incident coordination system. Use the interactive map below from the Northwest Interagency Coordination Center for tracking fires. Zoom in, scroll around, and see all the fires and their current boundaries and areas of spread. The three firefighters killed Wednesday in the Twisp River Fire (a branch of the larger Okanogan Complex) were transported by ambulance and procession of emergency vehicles yesterday. That speaks not just to the national focus on the fires in Washington, but to the attention, gratitude and respect paid to first responders and emergency personnel. At a news conference in Chelan earlier Thursday, Washington Gov. Jay Inslee expressed remorse and encouraged people to show that gratitude. Gov. Inslee at a press conference yesterday. 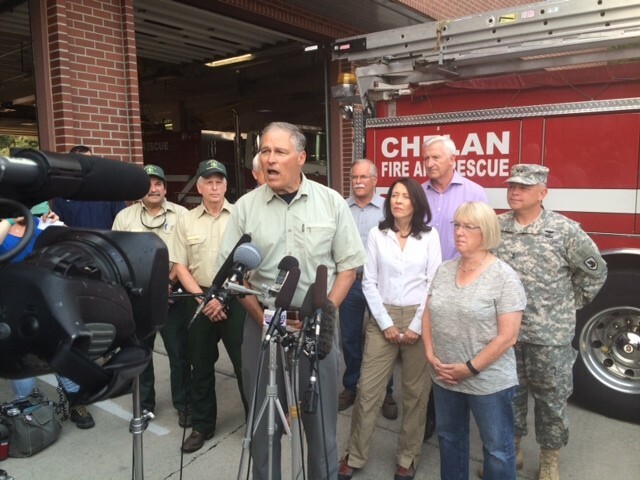 That “cataclysm” has reached a level, well, cataclysmic enough to prompt Inslee to request a federal disaster declaration, which was approved by President Obama today. U.S. Senators Maria Cantwell and Patti Murray and 8th District Congressman and former King County Sheriff Dave Reichert were on hand Thursday to support the request. 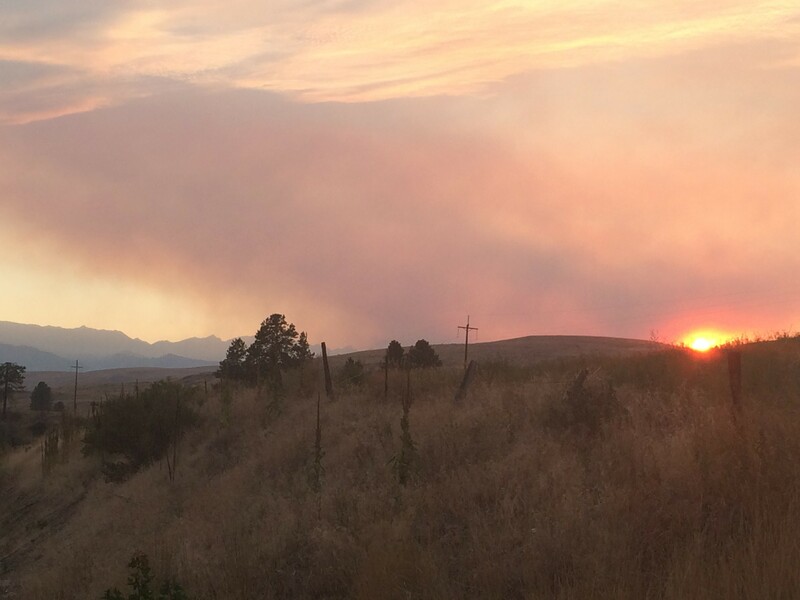 The Chelan Complex Fire received the lion’s share of national media attention in the past week since it started Aug. 14, due to its size and the number of homes, outbuildings and other structures burned (officially 67 as of this morning, but likely to rise). However, the deaths of the firefighters in Twisp, and now the larger and ballooning Okanogan Complex to the northeast, have shifted attention away from Chelan. The multiple lightning-caused fires that grew into the Chelan Complex (extensive info here) aren’t just affecting people immediately around its namesake town. The fire spread east last week, jumping the Columbia River into Douglas County, which is much more rural than Chelan County. 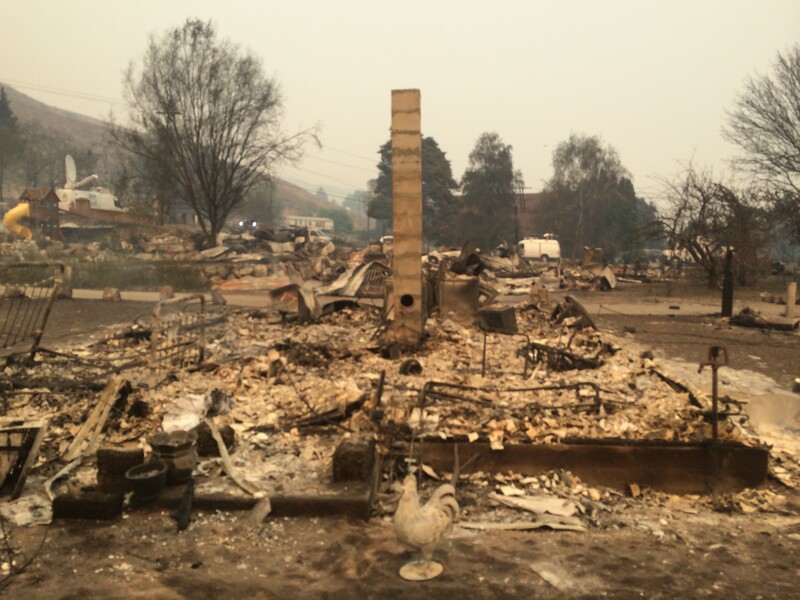 The Douglas side burned out quickly (17 structures – houses and outbuildings – were destroyed) and this week fire crews monitoring it were mopping up and looking for hot spots. Even though the current Chelan Complex is burning near and in some of the same areas as the massive 2014 Carlton Complex that devastated nearby Pateros, the two differ in a big way: The Carlton fire didn’t jump the Columbia River. 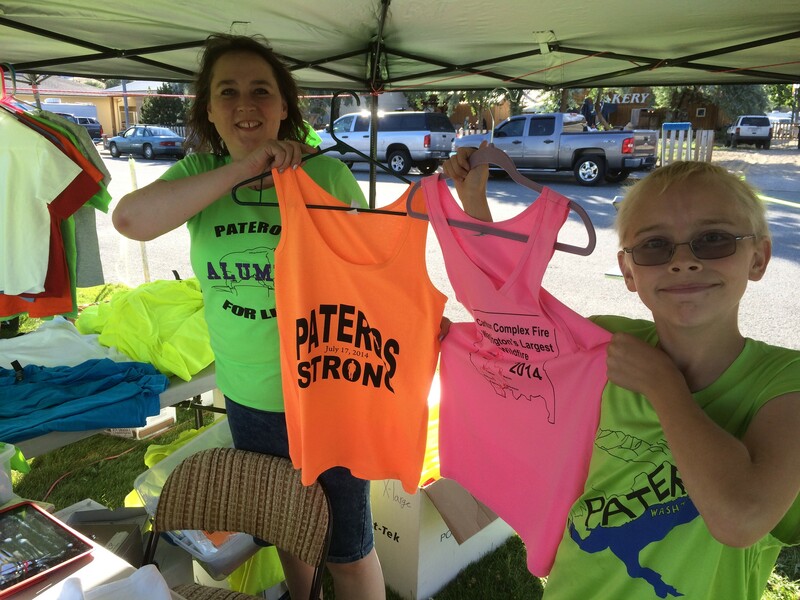 The term “Pateros Strong” is hard to miss in North Central Washington – it’s on signs, T-shirts, and bouncing around as a Twitter hashtag. It symbolizes the resilience of the small town to bounce back after the Carlton Complex Fire burned dozens of homes in July 2014. Kara Riggan and son Seth Gross sell Pateros Strong items in town during an event July 17, marking the one-year anniversary of the Carlton Complex fire. Nearly 20 homes burned in this neighborhood, including the mayor’s, pictured above. On Wednesday, after news of the firefighters’ deaths 30 miles up the Methow River, Pateros was a weigh station of sorts as residents and tourists left Winthrop and Twisp under a level 3 evacuation. Howard’s Lakeshore Inn, the waterfront hotel-gas station-restaurant, was buzzing with activity. What had once been a scene of devastation, where people fled from, was as least on this night where people fled to. She’s seen her fair share of fires and smoke-filled summers, having lived in Pateros seven years and grown up in Wenatchee. “But this seems like way more than I ever remember,” she says, noting that the fires seem to encroach closer and closer to towns and cities every year. But even so, she wouldn’t live anywhere else. “I gotta have my mountains,” she says. 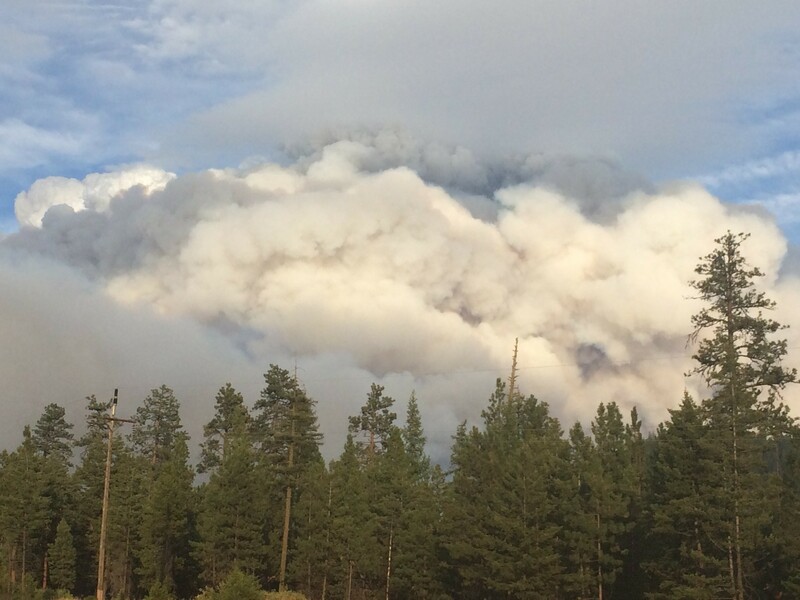 Even if those mountains are obscured – or engulfed – by smoke once in a while. When the mountains are shrouded in smoke, there’s a macabre reminder that pretty sunsets yielded by the smoke come at the expense of so much destruction, hardship and loss of life. As the sun set over the North Cascades Thursday night, a stream of smoke drifted across the horizon and left incredible pink hues from Twisp southward toward Pateros and Chelan. Just two hours before, a procession of vehicles carrying the fallen firefighters from Twisp had come out of that smoke-filled area and ascended eastward over Loup Loup Pass on Highway 20 toward Okanogan. The highway was closed shortly thereafter, as the fire near Okanogan blew up, and the procession passed by this scene on the way. Smoke once again engulfed the mountains. North Central Washington and Okanogan County had a long night – and many days – ahead.